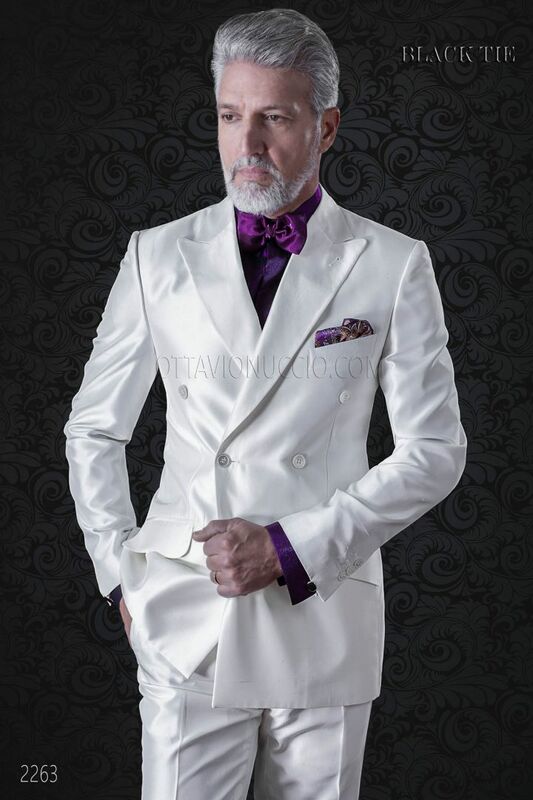 White shantung double-breasted men suit. Peak lapel, 2 vents at back and ON signature corozo buttons. Shirt made from fuchsia lurex with 'Emotion' collar. Concealed placket with buttons. Straight cuffs with signature nacar... Shirt made from fuchsia lurex with 'Emotion' collar. Concealed placket with buttons. Straight cuffs with signature nacar button and twin cufflinks buttonholes. Bow-tie made from purple lurex. Handmade. Handkerchief made from purple paisley silk.